The New Readers Publishers (NRP), a non-profit publishing project based at the Centre for Adult Education(CAE), recently donated close to 120 000 books to many different organisations across the country. The Howard College office of the NRP closed its doors in December, and thus as many books as possible were distributed before moving the remainder to the CAE in the School of Education on the Pietermaritzburg campus. Ms Sonya Keyser of NRP stated that the aim of the NRP project, which has been in operation since 1991, is to promote reading and literacy by publishing a range of easy to read books in all South African languages. The NRP team ran workshops to strengthen the capacity of educators and librarians to teach and support reading. The project also trained and offered opportunities to aspiring authors, illustrators and editors. With a desire to increase the reading materials available to adult literacy classes, and to continue to promote reading more generally, Keyser and her co-worker Ms Catherine Rich sent out a call to anyone working in the literacy field to send requests for books. ‘We asked for a motivation as to why they needed the books and what they planned to do with them, then we gauged and assessed the impact and “reach” these books would have for these networks and then we allocated books to everyone who applied. The response was overwhelming!’ explained Rich. The books were sent to various organisations across the country, including seven of the Polokwane Municipal Libraries, the Royal Bafokeng Institute in the North West, the Catholic Community Service in the Free State, Khalipha SP School in Umlazi, the Shine Centre in the Western Cape, the Ujama Resource Africa Project in Mpumalanga and even the Department of Correctional Services in KwaZulu-Natal. However, as the team began packing up books for distribution, logistics proved to be a challenge as some recipients of the books lived in rural areas and small towns where postal services were quite a distance away and were expensive. 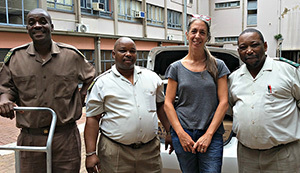 Despite the logistical difficulties, the recipients were committed to getting their hands on the one-of-a-kind books, with Rich even recalling one of the recipients who, upon hearing of the NRP book donation, jumped into his van with his daughter and drove from the Free State to Durban to get his books. Keyser further added, ‘It has been an emotional time, but it is rewarding to know that our books have had such an impact on reading and there is still such a great demand for these books. The NRP website will still be active and the Centre for Adult Education in Pietermaritzburg is hoping to launch e-book versions in the near future.’ Many people are dismayed at the NRP closing its main operation in Durban, but it has nevertheless been a most fulfilling and enjoyable journey for the dedicated team. As part of wrapping up the Durban office, an archive of adult education materials dating back to the apartheid years, and the NRP historical material, were donated to the Centre for African Literary Studies(CALS). CAE in Pietermaritzburg will also hold small numbers of each title published by the NRP and plan to continue supplying books to literacy projects, adult centres and schools. Ms Taadi Modipa has taken on this task, with the support of colleagues in CAE who wish to maintain the legacy of the NRP.